31 Agosto 2017 | in English. From September 5th to 10th let's camp against the military occupation of Sardinia. For more then 50 years Sardinia has been occupied on thousands of hectares by military firing ranges, military airports and bases, a bomb factory and at least a hundred other military buildings. On our island, nearly two thirds of the total Italian military asset is “hosted”. But never have we remained just watching: since the 1960s various actions have been brought up, including demonstrations and protests, the most famous one being the one of Pratobello, near Orgosolo, in 1969, but we can also remember Tertenia, Sinis and La Maddalena. In the last three years new life has been given to the movement, starting from the big demo against the Military Range of Capo Frasca in September 2014, which ended in an en masse entrance of protesters beyond the military nets. Since then, there have been more demos and obstructions against military drills. The movement has so found in direct action one of its most fruitful practices. On the other hand, the Italian State, with the silence of Sardinian government, has continuously shown brute force and its muscles. Bigger drills have been organized over the last years, occupying also new parts of Sardinian waters: an example is the Mare Aperto 2017 drill that caused fishermen to be cleared out from their usual fishing grounds. Other interests of our counter party have been the expansion of the bomb factory at Domusnovas, the so called RWM, and the further state financing of the Sardinia AeroSpace District, called DASS. For these reasons, the single and few demonstrations cannot be enough: it is necessary to start a structured political project on various levels that works on short, medium and long terms, knowing that our conflict won’t end in a few years. Starting from June 2nd 2016, groups and individuals fighting for Sardinia’s freedom from military use have come together in “A FORAS – contra a s’occupatzione militare de sa Sardigna”. All the components recognize themselves in the general objectives of A FORAS: obstruction and end of military drills, the closure of all military ranges and quarters, the reclamation of polluted territories, measure of the damage done and compensation of the community, reconversion of the bomb factory of Domusnovas. To achieve these ambitious goals, it’s necessary to build a working class and mass movement, rooted in Sardinia. 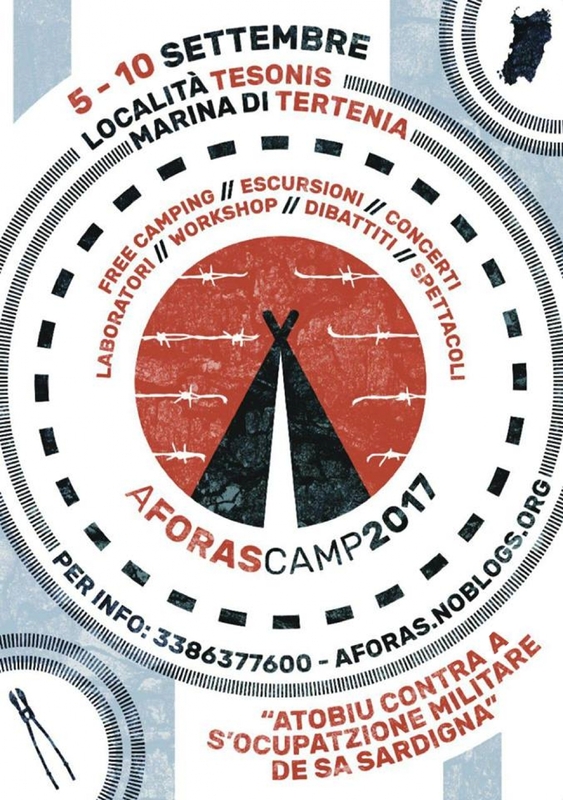 In more than one year, A FORAS has come up with different actions: demos at Capofrasca and Quirra to block military drills, a festival on June 2nd 2017 in Cagliari with a mass demo and an event where many artists have played to support our cause, organizing encounters in schools, universities and towns. On these occasions, we have presented our works and dossiers on the damage done by the military occupation of our island and raise up the debate for so much time soothed by the stance and the fabrications of the Italian Ministry of Defense. All these activities wouldn’t have been possible without the creation of the six permanent working-tables which, hand in hand with the general assembly, make up the backbone of A FORAS. These tables, whose work is dedicated among other things to activism in schools and universities, to the communication and the effects of the military bases on the territories, were actually born during the first A Foras Camp, which was in 2016 in Lanusei. Last year’s event has been essential also for the rooting of the movement in the area of Ogliastra. This area and the one of Sarrabus are oppressed by the biggest military range in Europe, the one of Quirra. The latter being the stage of thorium missile launches, the abandonment of military waste below and above ground, and most of all it is sadly famous for a syndrome that carries its name that has caused heavy damage to the wellbeing and health of the surrounding population. - Outward communication, art and propaganda: create a collective imaginary for the movement against the military occupation. One of the innovations regarding last year will be the dedication to internal development and education. Using the analysis on the case of Quirra, we will try to better our knowledge on the military system, working also on the outward performance of our motives. The camping also includes numerous moments to socialize, like for example field trips/excursions, showing films and documentaries, concerts and dj sets, counting two important ventures in the town which have been organized together with Tertenia’s community. The goal of this camping is a double one. On the one hand, we want to revamp the work of A FORAS, with the use of working-tables and self-development. On the other hand, we don’t want to be seen by the community that is hosting us as irrelevant or strangers: all the contrary, we want to expand involvement in our camping and in general in the conflict against military bases. Just as last year, the attendance to the camping is free, all activities are self-managed and conducted all together. The camping will be open to everybody, with the distinguishing characters that have always been essential in our movement: antiracism, antifascism, antisexism and anticolonialism. We’ll wait for you from September 5th to 10th to continue the conflict against the military occupation of Sardinia.